Analyzing the Acer W510, The Worlds Lightest Windows 8 PC…For Now. Starting from 9th November in the US you’ll be able to buy a Windows 8 PC, a full Windows 8 PC, that weighs just 1.27lb / 658gm â€“ lighter than the good old handheld ultra mobile PC favorite, the Viliv X70EM and lighter than any full-size iPad. The Acer Iconia W510, part of the Acer Iconia W5 Series, runs a dual-core 1.5Ghz Clover Trail CPU with turbo boost to 1.8Ghz, a newer GPU, 32BG of solid-state storage, an optional keyboard dock, a claimed 9hrs of battery life and a 1366×768 IPS multitouch capacitive touchscreen. The Viliv X70EX started at about $600/ The Acer Iconia W510 starts at $499. In Europe you’ll get the dock thrown in for a total of 500 Euro. Acer have always been a leader in knocking down prices and the W510 is no exception as the price, at least in Europe, is so low for the tablet/dock combination that we wonder if it’s really correct. â‚¬499 (â‚¬415 pre tax) is completely new territory for this sort of device. Of all the Windows 8 tablets the Iconia W510 is the lightest and smallest. A 1366×768 screen offers a mainstream level of pixels per inch which will help, compared to higher resolutions, in Windows desktop and GPU processing. IPS will improve the look of the screen and remember that ClearType can really help to smooth fonts. A lack of FHD resolution is less important than you might think. On battery life there’s a lot to be talked about. The built-in 27Wh battery is going to disappoint if you’re thinking about Acer’s claims of 9hrs. 9hrs may be possible on 720p H.264 playback on low screen brightness with Wi-Fi off because of some new power-saving features and this is perfect for seat-back usage on long-haul flights but if you want to get into working with the W510, expect much, much less than that. I haven’t tested Clover Trail fully yet but 5hrs would seem a good estimate at this stage. It really depends on screen brightness and connectivity usage. For a Windows 8 PC this is actually quite stunning but there’s more. For the â‚¬499 price you’re getting an additional battery in the keyboard dock. We can’t see what battery size is in the dock yet but given that Acer is quoting double the run time it’s obviously another 27Wh minimum. That’s a really useful addition. Some testing is needed with Clover Trail and Windows 8 but given the new S0ix low power modes there could be some advantages of working in the ‘Modern’ (was Metro) user interface where software is more controlled and has access to better power saving features. Again, that needs testing. At the very least we should see a massive improvement in screen-off standby (AOAC, Connected Standby) times to the point where you might not have to turn it off during a typical day. The one Clover Trail tablet I didn’t get my hands-on at IDF this year was the W510! The Envy X2 and ASUS Vivo were in my hands, but I had to leave before getting to the front of the queue for the W510. I’m left trying to interpret some of the other hands-on out there. The Verge has one of the best ones right now and is fairly positive about the product. There’s no word on battery life though. ARSTechnica has a short hands-on review but is worried about build quality. Slashgear has some notes and a video here. This video from CNet mentions a shallow keyboard. The reviewer says he missed keypresses although in a quick ‘first look’ you’re not exactly going to be up to speed if you’ve just come from a full-sizer. A ultra mobile PC comparison. By taking a look at some of the specifications it’s interesting to see where we are on the ultra-mobile PC timeline and to think about the possibility of a smaller handheld Windows 8 experience. One of the most important figures for me in the above table is the volume. It’s BELOW that of the X70 which means it’s possible to build a new-generation Windows 8, 7 inch tablet on Atom Clover Trail. 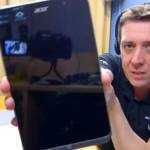 With some quality engineering a 16mm Windows 8 7 inch tablet would be possible. With a smaller battery maybe even a 12mm thick Windows 8 7 inch tablet would be possible. A lot more has changed though. Lower power RAM, a single-chip solution, a new graphics core and dual-core CPU that includes Turbo Boost. Performance won’t be stunning but should blow away the performance we saw on most UMPCs. Because of the SSD, performance ‘feel’ should be better than most netbooks too. The recent dual-core versions really weren’t that bad at the full web experience. There’s potential here for a 7 inch experience and maybe something even smaller for niche customers although the low price of the W510 means specialist solutions with low production runs will look more expensive than ever. I’ll leave you with Acer’s recent promo video for the W510. Please leave your thoughts below. 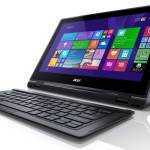 I have a chance to play with an engineering model of Acer W510 and also a Microsoft Surface yesterday. The keyboard for Acer W510 feels cheap but usable, and I prefer it more than the Surface keyboard. The Surface keyboard is much higher quality and feels roomier but is really annoying (not just the touch, even for the regular one). Mainly because Microsoft removed all the labels from the functions keys. To press a function key, you have to perform some sort of finger gymnastics and count from left to right… Most users won’t care but it’s extremely annoying for technical users. Not to mention comparing Win RT with regular Win (I’m surprised that Win RT has command line and can run batch files). But I still prefer the Acer W510 even with the poor built, it’s lighter than Surface and has longer battery when combined with keyboard. Atom also is quicker than nVidia Tegra when running anything other than Tegra optimized games. If size is not a issue, I will buy a HP Envy x2 (even thought it’s more expensive), that has higher quality, more ports and one more SD slot. But I think I’ll end up with Acer W510 just for the size and weight advantage. I am almost certain to buy the 510 as soon as it comes out! I have the Acer W500 running Windows 8 Release Preview and I am satisfied with the performance of that device and the full blow OS except for the bulky size, a tipping tablet part over the keyboard and a low battery life. Even with those limitations a full blown Windows OS with fantastic Metro interface and the desktop mode for legacy work is working out for me fine. I am a sys admin who is on-call for some critical systems and nothing less than a full OS will do for me. 510 is light weight, the keyboard will provide additional battery, and, according to some review, the Clover Trail Atom in 510 is pretty good. I just wish the price for the bundle was around $600 instead of around $750. Since it was possible to make the Viliv N5 with an Atom, shouldn’t it be possible to make a similar form factor with Atom Clover Trail and Windows 8? I realise the requirements for a higher resolution screen might be a problem, but still think it should be possible. Is there anything on the horizon that 7″ or below? If someone makes something that fits in a jacket pocket, ie 5-6″ screen, I’ll buy it! My Everun died earlier this year, and I feel bereft. I too am looking forward to a 7″ windows 8 pro tablet for quite a while now. I currently carry a Google Nexus 7 in my pants pockets (not hard–even while I drive) as a troubleshooting device for servers but a Windows 8 Pro based will give me much more power and ease of use. There IS a demand for such devices out there. I hope someone is listening. Lightest? Are you sure? Have you checked the fujitsu qh55? I think it is lighter at 574 gram.